In theaters this film provided an awesome sense of giant waves both visually and with its 5.1 Dolby sound. The movie is fantastic regardless, but a killer home theater system would help. This fairly loaded DVD isn't quite as much fun as Peralta's "Dogtown & Z-Boys" disc, but the director's commentary track with editor Paul Crowder should engross those interested in the film's wild and unique visual style, great stories of how the film came together, and satisfying additional details about exactly what and who you're seeing in the film's archival footage. The second track with several of the featured surfers gets off to a bad start when they introduce themselves -- and then it's dead air for 30 seconds. When they do start talking again, the commentary turns into an insiders-only affair, full of unexplained jargon and people on screen identified by first names only. These guys are clearly not thinking about the listener at all. There are good tidbits of history from Greg Noll (talking about 80lb. boards, the development of fins, etc. ), but if you're not a surfer don't even bother. The 30m making-of begins with standard-issue press-tour interviews, but later it settles into something deeper about the visual style and Peralta's interview style. A bunch of terrific deleted scenes genuinely add something significant to the experience of the movie (and include complete explanations for why they were cut). But the waste-of-time "Blue Carpet" special shot at the premiere is nothing but plastic, overly enthusiastic entertainment-TV types asking asinine interview questions of arriving celebrities. There have been surfing documentaries before -- mostly hot-dogging sports flicks comprised of "wow" footage with ace boarders facing down big, beautiful, ominous waves. But even "Endless Summer," this mini-genre's high-water mark, isn't as comprehensive or exhilarating as "Riding Giants," which revels in the sport's thrills and perils, in its history and minutia, with the same wit, insight, enthusiasm and cinematic acumen that director Stacy Peralta brought his ingenious 2002 skateboarding doc "Dogtown and Z-Boys." Opening with a Hallelujah Chorus of monster swells crashing over on themselves (heard in 5.1 Dolby Surround and seen from all the traditional angles plus awe-inspiring aerial shots), the film gets off to an imaginative start with a rapid-fire primer tracing surfing from its Polynesian roots to its "Gidget" popularization. Peralta then coasts into the unique crux of this movie: the personal histories of (and engrossing interviews with) some of the sport's 20th century heroes. Beginning in the 1950s with Greg Noll, who along with a dozen or so other Hawaiian beach bums forged the whole surf culture we know today, the film waxes poetic about the purity of their lifestyle (these guys literally slept on the beach and lived off the land and the sea) and pays homage to their pioneering pluck and their particular landmark accomplishments. Peralta's own narration and "Dogtown" editor Paul Crowder's almost symphonic arrangement of rare archival footage (leaving the grit on found stocks of 8mm and 16mm film is part of this team's dynamic style) is so spellbinding that when "Riding Giants" visits various milestones -- the first time Noll braved the daunting waves of Waimea Bay in October '57 or his attempt to ride six-story storm swells in December '69 -- the movie doesn't just make you understand their significance, it can give you goosebumps. The quest for bigger, more perfect waves in the ensuing years takes the documentary around Hawaii, then around the world, sometimes showing side-by-side comparisons of various locations' waves. Along the way Peralta touches on the physics of wave formation, and the evolution of the sport and its equipment, all of which culminates in gorgeous, heart-stopping footage of the latest intrepid trend: jet-ski-assisted "tow-in" surfing (boarders are sling-shotted into 10-story waves they could never paddle into), which has recently led to pros conquering waves no one would have dared ride before. Courageously, Peralta doesn't shy away from the dangers and deaths that have, on occasion, shaken surfing culture to its core -- and with the wince-inducing wipe-outs the director serves up from time to time, that's easy to understand. 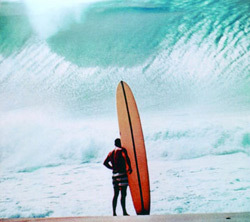 But at its heart, "Riding Giants" is a work of pure joy, which is reflected in the exalted passion of its interviewees and effectively personified in the personal backstories of legendary surfers like Noll and Laird Hamilton, the sport's current king (and one of the picture's executive producer). "Riding Giants" has all the jaw-dropping hot-dogging any surf fan could want (although fandom is not a prerequisite for enjoying a documentary this thorough and thrilling), but it's these touches of humanity and historical context that carry the movie above and beyond just stunning visuals and creative filmmaking.